You will love this beautifully furnished 1/1.5 cozy apartment. White carpet and ceramic tile throughout. Bedroom has a king sized bed with a TV and walk-in closet. Beautifully painted mural runs the length of the unit. Apartment has a full master bath and and a half bath. Fully equipped kitchen with microwave, coffee maker and toaster. Casual dining room. This unit also has a washer/dryer. Comfortable living room has a queen size sofa bed and double glass sliding doors leading to a small terrace with lush foliage and two lounge chairs. This unit is non-smoking and no pets are allowed. This unit is located in a gated community, surrounded by gardens and 24 hour security. 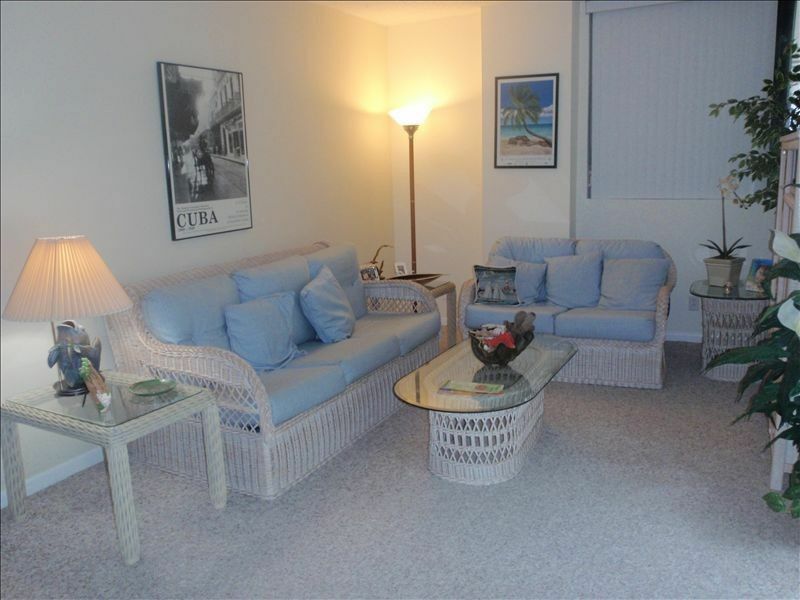 Within walking distance of restaurants, parks, and churches. Heated swimming pool. Beautiful landscaped pool deck.Landscaped sitting courts.800-foot stretch of oceanfront.Heated oceanfront swimming pool.Twelve all-weather tennis courts.Oceanfront gazebo with kitchen and bar.Convenience Center with host of shops. Come and enjoy all the amazing ammenities this property has to offer. Relax on the beach or in one of the two pools. The ocean-side pool also has an outdoor cafe that serves lunch and snacks. The private beach with white sandy beaches is great for a swim or just for lounging under an umbrella. The private beach is great for kids and adjacent to the Ritz Carlton and Crandon Park Beaches. Key Biscayne is an upscale tranquil island community with so much to offer. Take advantage of all there is to do and just minutes away are Crandon Park & Beach, Miami Seaquarium, Crandon Marina, Cape Florida Lighthouse and Key Biscayne Golf. This unit is also minutes away from the annual Sony Ericson Tennis tournament. Miami International Airport, Brickell, Downtown Miami, South Beach, Coral Gables and Coconut Grove are all less than 30 minutes away and offer an array of shopping, dining and entertainment. We live in sunny Miami with 4 kids and 4 grand kids. We use the unit throughout the summer and open it for others to enjoy during the winter months. This beautiful unit is located in Key Biscayne Florida. It is a beautiful location, located near Bill Baggs state park. Walking distance from the beach. Furniture and beds were basic and a bit outdated. The toilet in the bathroom off the dining table never stopped running, kind of annoying but we were basically only in the room to sleep and eat a quick lunch. Everything was functional though and clean. The complex the unit was in was very nice. The beach was great and quiet. Never had to worry about not getting a beach chair and umbrella. We tried both pools that were available to us. The one by the road was kind of loud because of the road traffic. The ocean pool was very nice and quiet. Went out to eat to Sir Pizza which was very good. Also went to Whisky Joe’s, food was good and more of a bar. Randazzos was amazing, great food. Overall great place, would stay here again. Perfect for a quick trip to Florida! Very clean. Comfortable. Very organized. Well located. Golf nearby and lots of tennis courts. the apartment meet all the requirements we need for our stay . All fixtures And equipments working well , towels, and accesories in good condicions. I call it my new home in Miami. Host are more than great and the place has an enchanted effect!! Everything was in place and very comfortable. Hola Carolina, it was very nice to meet you. I am glad that you could enjoy your vacation. Just minutes away are Crandon Park & Beach, Miami Seaquarium, Crandon Marina, Cape Florida Lighthouse and Key Biscayne Golf.It is also minutes away from the annual Miami Open Tennis tournament. Miami International Airport,Brickell,Downtown Miami,South Beach,Coral Gables and Coconut Grove are all less than 30 minutes away and offer an array of shopping and entertainment. Within walking distant to the PANKEY INSTITUTE.